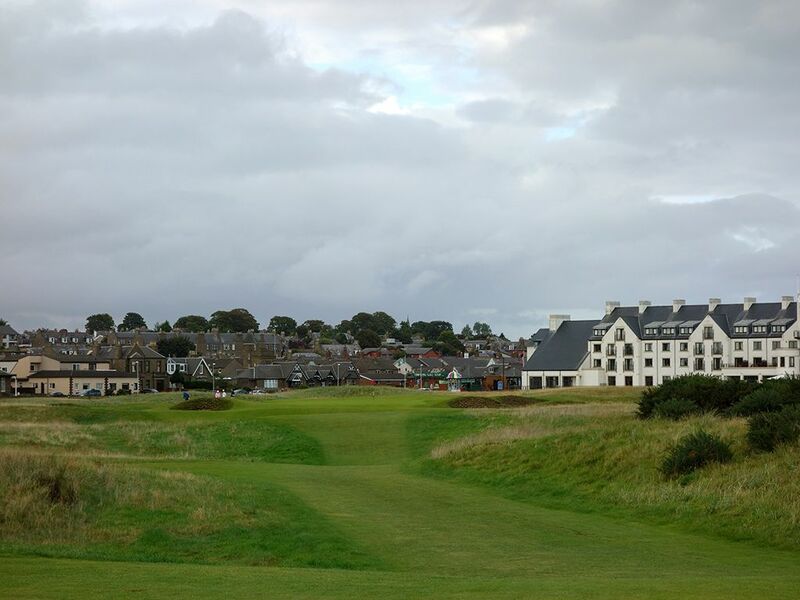 Course Website: Official Website - Visit Carnoustie Golf Links (Championship)'s official website by clicking on the link provided. Accolades: Ranked 7th in Scotland by Golf Course Gurus. 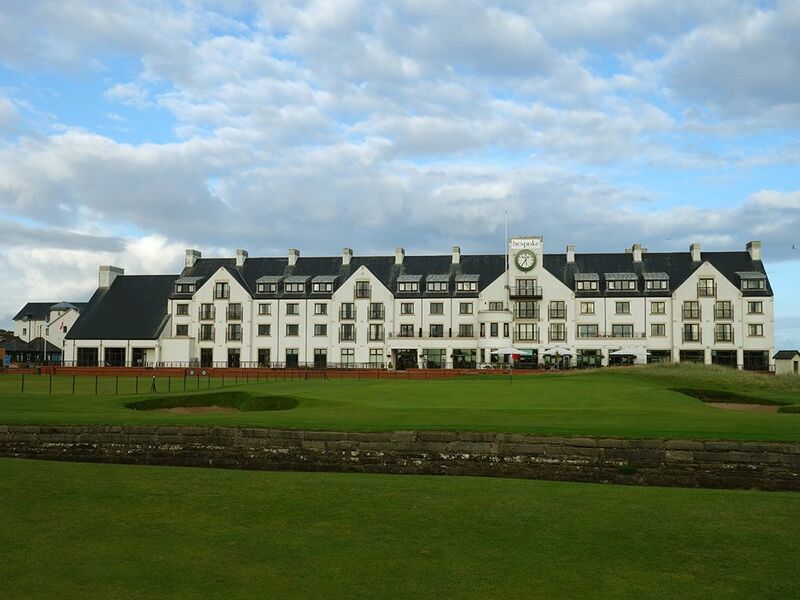 What to Expect: Carnoustie stands as one of the great municipal golf courses in the world. 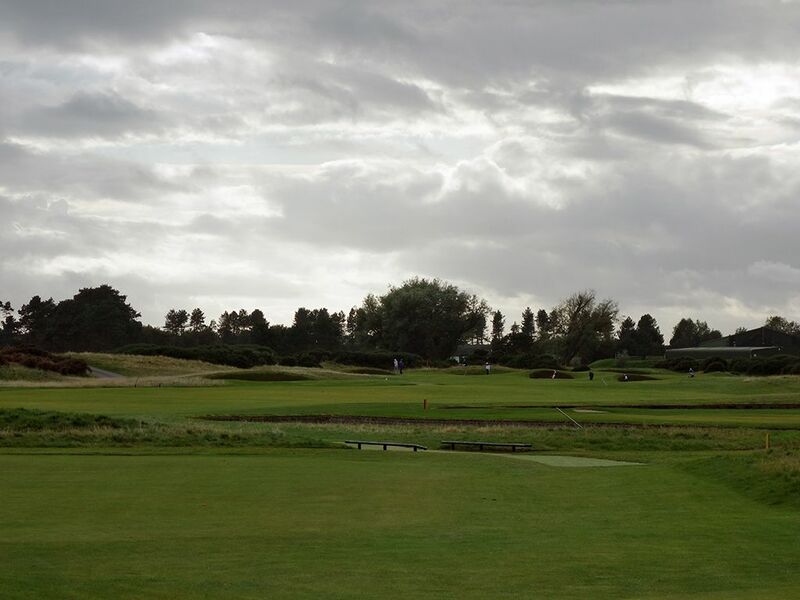 In the same vein as Bethpage's Black course and Torrey Pines' South course, the Championship course at Carnoustie offers visitors a chance to tee it up on a major championship venue owned by the city in which it resides. Like those fellow munis, Carnoustie has a reputation of being one of the toughest courses you'll ever encounter which has earned it the nickname Car"nasty." That being said, the course isn't as brutally difficult as its reputation and frankly is just a great overall test of golf worthy of its spot on the British Open rota. Getting to the expansive property is an unassuming venture through the quaint town before going through a tight tunnel that traverses under a railway. Upon exiting the tunnel you are presented with a glimpse of the amount of land the famed links occupy. There are three courses to play at Carnoustie so making a day or two of your visit there is certainly a welcome opportunity. The property is as flat as anything you'll encounter in Scotland which is great for walking but a disappointment in terms of ocean views or drama in the terrain. 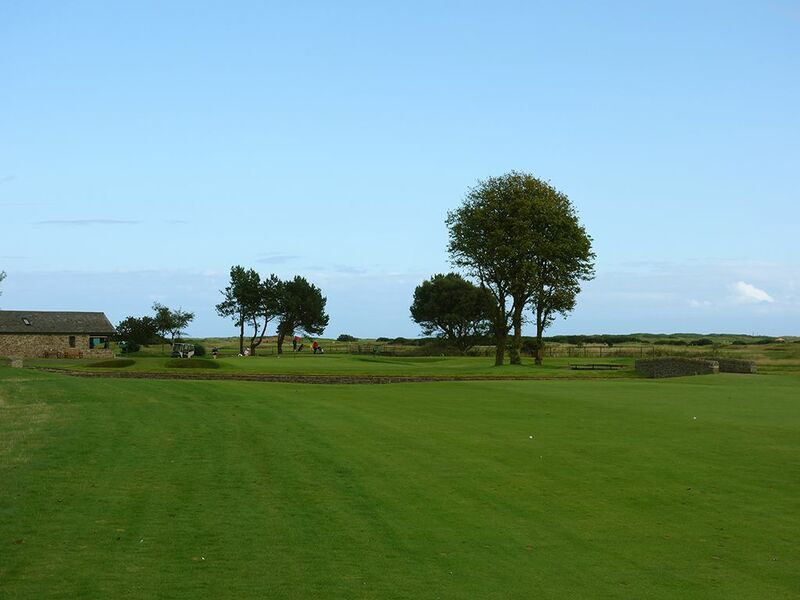 Opposite of Royal Troon where the middle six holes are the best, Carnoustie has six good opening holes, six fantastic closing holes, and six forgettable holes in between. The variety of hole lengths, directions played, and challenges presented is absolutely brilliant and makes the course an enjoyment round after round after round. Perhaps the most impressive feature though in the routing is how well incorporated Barry Burn is; a meandering water hazard which may have become the most famous ditch in the world in 1999 when Jean Van de Velde's encounter with it cost the Frenchman the Open championship. The deep burn has several ball retrievers placed along it which are close to 20 feet long and allow players a chance to retrieve their pellet when they find the watery bottom. For those looking to have a true championship experience, caddies are available for hire while maneuvering the walking only course. 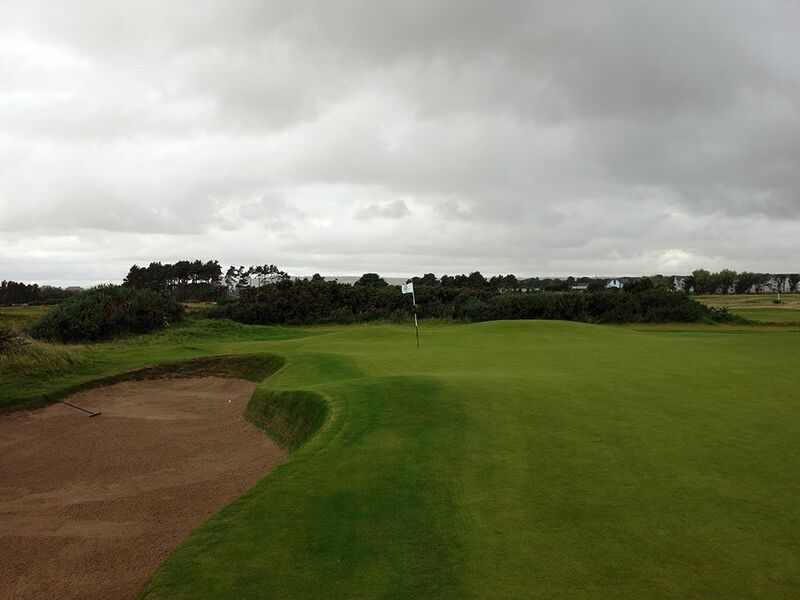 While Carnoustie is a really good course and a stout test, however the lack of variety in the terrain combined with the weak stretch of holes though the middle of the course hold it back from being a top 5 offering in Scotland. Signature Hole: 18th (Home) Hole – 499 Yard Par 4 – The closing hole at Carnoustie is one of the best in Scotland and in championship golf. While it is best known as the carnage site of Jean Van de Velde's 1999 Open meltdown, Carnoustie's home hole has a long list of victims it has claimed over the years including Johnny Miller in 1975. What makes Carnoustie's home hole so great and challenging is the length, trouble, and pressure it brings. For Van de Velde, it was the thick rough and Barry Burn that caused his demise which led to a double bogey and eventual loss in the playoff. For Johnny Miller it was the last of the three fairway bunkers up the right side that took two strokes to get out of and kept him out of the playoff that Tom Watson eventually won. Barry Burn frames each side of the fairway initially before cutting out on the right side where the fairway bunkers come into play. Barry Burn similarly cuts out on the left side where an o.b. fence then takes over as the left boundary. Barry Burn doesn't stay away long though as it cuts back in front of the long, skinny green 20 yards from the front edge and teams up with a pair of bunkers protecting the front of the putting surface. Par here is a heroic feat, something 2007 Open champion Padraig Harrington failed to do on the 72nd hole but was able to recover from two trips to Barry Burn and a double bogey to eventually beat Sergio Garcia in a playoff. Best Par 3: 16th (Barry Burn) Hole – 248 Yards – The closing four holes at Carnoustie are as strong of a test as there is in championship golf, and the only par three in that stretch is the testing 16th. Five bunkers stand between the tee and the green while a pair of hillocks frame the left side of the putting surface. Going long is clearly better than falling short and favoring the right side will lead to more save saves. Often playing into the wind, this hole can feel more like a driveable par four than it does a par three. In fact, in 1968 Jack Nicklaus was the only player that managed to hit his tee shot past the pin during the final round and Tom Watson never managed to card a par during five tries in his 1975 Open victory. The majority of pars amateur players will score on this hole will be a result of getting up and down since greens in regulation are few and far between. Best Par 4: 17th (Island) Hole – 461 Yards – Named "Island" due to Barry Burn coming into play on both sides of the first fairway, an accurate drive is a necessity here. Players feeling good about themselves may try to bust a drive up the left side which requires a 260 yard carry to reach the second fairway while going up the right cut line needs 290 yards to stay dry. Players that carry Barry Burn on the left with their drive could however find themselves in the fairway bunker and severely reduce their chances of reaching the green in regulation. The approach shot plays to a green with a thin opening on the left side before ballooning out to the right across the back two-thirds of the putting surface. A pot bunker sits 35 yards short of the green while a trio of bunkers protect the right side. When the wind is to your back you may feel brave enough to carry Barry Burn off the tee and set up an easier GIR, but into the wind this hole is a brute. Best Par 5: 6th (Hogan's Alley) Hole – 578 Yards – The strokesaver calls Hogan's Alley the signature hole at Carnoustie and it is certainly its best on the front nine. 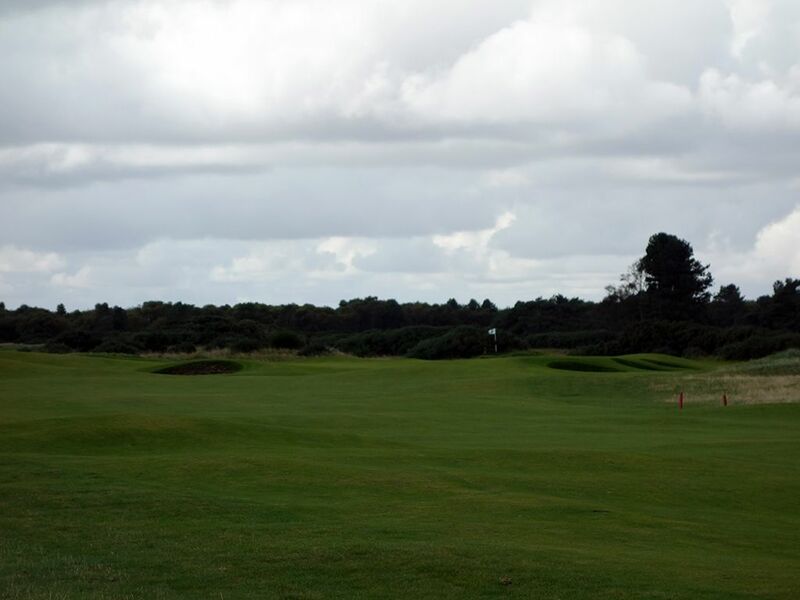 The hole gets its name from the daring line Ben Hogan took enroute to being crowned champion of the 1953 British Open. Ben drove his tee shot in the gap between the out of bounds fence on the left and the fairway bunkers in the middle. Navigating this line puts players in the ideal position to attack the green in two with the least amount of trouble to contend with. The green is protected by a pot bunker short, three pot bunkers on the right, and a large bunker deep. Missing the green by very far can result in a lost ball consumed by the surrounding gorse that is unforgiving to say the least. You can't take a break on this hole and without putting a blemish on your scorecard. The tee shot must avoid the four fairway bunkers, the second shot must steer clear of the 70 yard long ditch up the right side, and your flatstick better be spot on to navigate the undulated green. 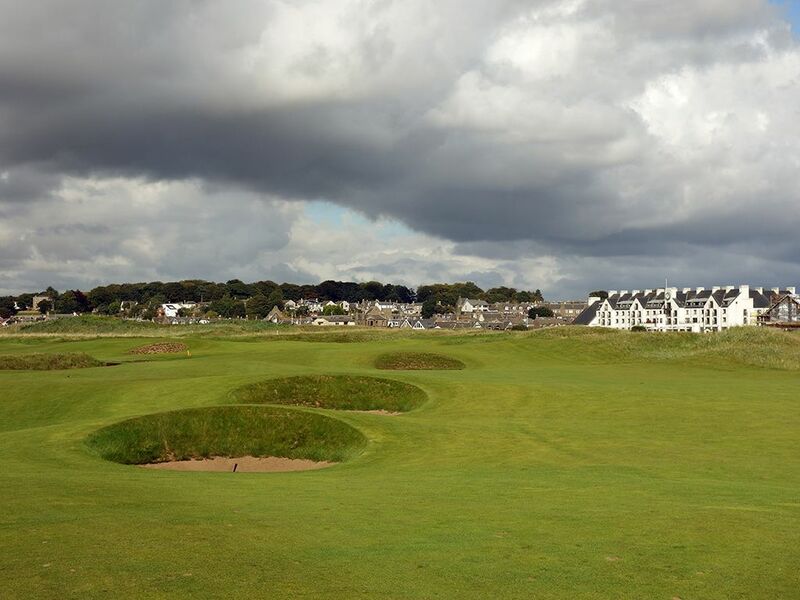 It is a fantastic hole and worthy close to the opening six holes Carnoustie is well known for before the course takes a six hole lull in advance of the world class finishing stretch. Birdie Time: 3rd (Jockie's Burn) Hole – 348 Yard Par 4 – The shortest par four on the course greets you at Carnoustie and is part of the gentle opening stretch the course in known for. Tee shots that clear the three nearest fairway bunkers will be in prime position for an approach shot that can be stuck close. Jockie's Burn, the hole's namesake, cuts in front of the green and frames the left side of the fairway and becomes the biggest threat to contend with. Ultimately though, it would take a very poorly struck shot to end up in the watery grave so your confidence should be at its height with a wedge in your hand going pinseeking. A generous sized fairway and green are key elements to scoring well here so take advantage of them. Bogey Beware: 10th (South America) Hole – 446 Yard Par 4 – What do you get when you take the hardest hole on the course that is often considered the most difficult on the British Open rota? You get a ton of bogies. The difficult 10th got its name after a caddie reportedly was scheduled to leave for South America on a boat. After getting drunk and passing out in the fairway, he woke up the next day and said, "Am I in South America?" The legend behind the story isn't as important as the skill you'll need to demonstrate here. Tee shots must avoid the trio of fairway bunkers up the right side to have any shot at reaching the green in regulation. Barry Burn cuts across the fairway 40 yards short of the green and must be carried enroute to the putting surface protected by three additional bunkers. When playing into a head wind, a common occurance, players may elect to lay up short of Barry Burn and take their chance at getting up and down. With one of the tighter fairways on the course and trouble abounding, bogey here isn't a score to be ashamed of.